Healthcare is the new segment which is growing bigger with the coming of wearable feature gadget and new wireless technologies. Healthcare is leveraging the new trends in niche technologies and bringing new products to the customer which was dream till few years back. Tele-Medicine or TeleHealth is one such outcome which allows the people in rural areas, far distance place to send their health information to the doctors with the tap on their mobile using Near Field Communication [NFC] wireless technology and Internet. NFC is low data rate wireless technology used to transfer data when in close proximity. ST also has products which supports NFC communication. They are categorized as M24LRxx/M24SRxx familyof products. M24LRxx/M24SRxx also known as ST Dynamic NFC & RFID Tag has EEPROM in addition to NFC. STMicroelectronics M24LRxx (Dual EEPROM) is Dynamic NFC tag with Memory up to 8 KB. They are passive in nature and get energized when an active NFC transceiver comes within the range. They can be integrated in healthcare design like Weighing Machine, Pulse Oximeter, Glucometer, Blood Pressure Monitoring Machine etc. The application can be used to log the daily, monthly health records in its memory. Health Data recorded in its memory can be further retrieved by using a NFC based smartphone to view and to share it with the doctor. 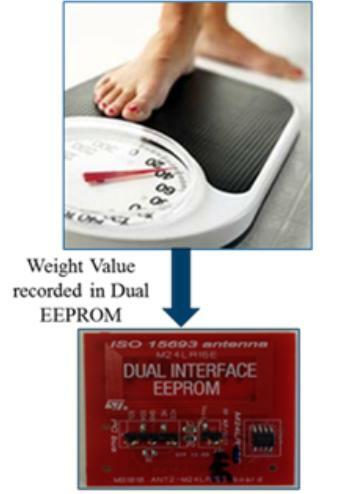 ST has come up with an Android Application called as NFC based Weight Recorder. The application reads the body weight recorded on the Dynamic Tag through NFC and sends it on user account on Microsoft HealthVault on Internet.Figure 1 shows the Android Application developed to perform above said task.